Gong xi fa cai! It's February already. Have you started to lo-hei yet? Yesterday, I met someone who says he did it 50 times last year - imagine that! Well, I have rounded up five of the more unusual yusheng available, so hopefully tossing for fortune can be a bit more interesting. 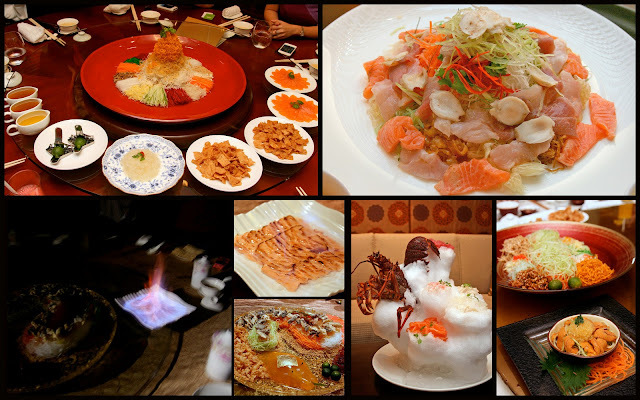 These include lo-hei the sustainable way, bird's nest, salmon flambé, crab roe and sea urchin yusheng, and an amazing tower of lobster and sashimi. great stuff! Happy New Year dear, to u and family! Thanks, Ciki! Happy lunar new year to you and the gang too!